Jimmy Carter, 39th President of the United States from 1977 to 1981. Copyright 2007-2008 by Will Johnson wjhonson@aol.com, Professional Genealogist. All Rights Reserved. This page has been locked, if you'd like to comment on it, please email me. If you enjoy the research done here, consider making a financial contribution to keep research like this going. James Earl "Jimmy" Carter Jr was born 1 Oct 1924, the eldest child of James Earl Carter and his wife Lillian Gordy. Jimmy grew up in Plains, Sumter County, Georgia. Jimmy Carter, graduated from the U.S. Naval Academy at Annapolis, Maryland, in 1946. That summer on 7 Jul 1946, he married Eleanor Rosalynn Smith (born 18 Aug 1927), who was also from Plains. Jimmy, an officer in the Navy was stationed in various locations which explains the varied birthplaces of his children. When his father died in 1953, Jimmy resigned his commission in the Navy, returning to Plains, Georgia to run the family peanut farm. John William "Jack", b. 3 Jul 1947 in Portsmouth, Virginia. James Earl III "Chip", b. 12 Apr 1950 in Honolulu, Hawaii. Donnel Jeffrey "Jeff", b. 18 Aug 1952 in New London, Connecticut. Amy Lynn, b. 19 Oct 1967 in Plains, Georgia. Jimmy Carter was elected Governor of Georgia in 1970. 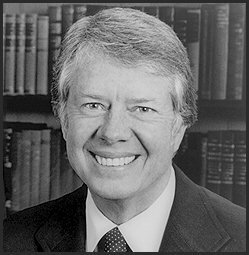 Jimmy Carter a "wealthy peanut farmer" ran for president of the United States and was elected 39th president in 1976, serving from 1977 until 1981. His vice-president was Walter F Mondale of Minnesota. Under Carter's presidency, large strides were made in Middle East peace, he being instrumental in normalizing relations between Egypt and Israel, but also the United States saw some of the highest interest rates recorded this century. After his re-election bid was defeated in 1980, Jimmy and Rosalynn returned to Plains to find their farm, which had been run in a blind-trust by managers was in very bad shape. Making them perhaps one of the only first families to leave office poorer than when they entered. Shortly afterward, he and Rosalynn jointly wrote his presidential memoires which constitute as well an autobiography. Jimmy Carter was awarded the Nobel Peace Prize in 2002. 1930 Census of Sumter County, Georgia showing : "Earl Carter 35 b GA, owns home, married first at 29, Farmer; Lillian 31 b GA, married first at 25; Jim E 5 b GA; Gloria 3 4/12 b GA; Ruth 4/12 b GA"
James Earl Carter was born 12 Sep 1894 in Arlington, Calhoun County, Georgia, the son of William Archibald Carter and his wife Nina. He married in 1923 to Bessie Lillian Gordy and they had several children including the future President Jimmy Carter. He died 22 Jul 1953 in Plains, Sumter County, Georgia. At his death, his eldest son James "Jimmy" resigned from the Navy, returning home to take over running the peanut farm. 1900 Census of 1435th Militia District, Early County, Georgia : "William A Carter, Head, WM, Nov 1858, 41, married, 14 years ago, b GA/GA/GA, Manufacturer, working on own, owns home; Nina, wife, WF, Dec 1862, 37, married, 14 years ago, mother of 4, 4 living, b SC/SC/SC; Ethel, daughter, WF, Feb 1887, 13, b GA; Alton, son, WF, Aug 1888, 12, b GA; Lula, daughter, WF, May 1891, 9, b GA; Earl, son, WM, Sep 1893, 6, b GA"
1910 Census of Sumter County, Georgia showing : "Nina Carter 45; Ethel 23; Alton 31; Earl 15; Gennell 6"
Georgia Deaths, 1919-98 "Inf. of Earl Carter, 30 Apr 1920, Sumter County"
Family Data Collection "James Earl Carter, born 12 Sep 1894 Arlington, Calhoun County, Georgia; died 22 Jul 1953 Plains, Sumter County, Georgia; married Bessie Lillian Gordy"
Bessie Lillian Gordy was born 15 Aug 1898 in Richland, Stewart County, Georgia, the daughter of James Jackson "Jim Jack" Gordy (1863-1948) and his wife Mary Ida Nicholson (1871-1951). Her father was postmaster in Richland. Lillian studied nursing, completing her studies in 1923, after which she married businessman James Earl Carter. Their eldest child Jimmy Carter was born in 1924. Their next three children were Gloria (1926-1990), Ruth (1929-1983) and Billy (1937-1988). Bessie Lillian Carter died 30 Oct 1983 in Americus, Sumter County, Georgia. She was buried at Lebanon Church Cemetery, next to her only husband, who had died 30 years before. This page was last modified on 20 November 2010, at 04:31. This page has been accessed 51,184 times.